Every year, Everything is Possible welcomes dozens of young people from all around Europe and the world to help on a project ran by us (as part of the Green Messengers) to keep Leeds Festival environmentally friendly. The main activities take place at Leeds Music Festival – one of the biggest festivals in the country at which the capacity is 80,000 people. During 2 weeks volunteers with the support of Everything is Possible oversee the recycling of drinks receptacles and encourage other campers to recycle their rubbish by dispensing refuse sacks around the public campsites and creating recycling points for campers to be able to separate their waste. After the festival volunteers are involved in the salvaging of good quality camping equipment that is so often left behind by festival-goers overly keen to vacate the park. This equipment is sorted and distributed to local community groups and charities in the days following the festival. 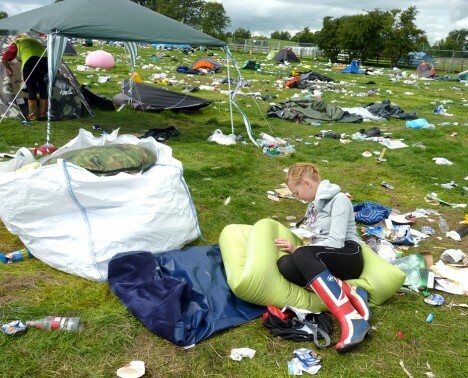 We passed onto them more than 400 tents, 350 sleeping bags and 300 roll mats and tonnes of camping items which are left behind at Leeds Festival, equipment which has often only been used for one weekend. This action is very well received by local community organisations as many really needs this equipment for their own activities. “Thank you for all of your support the salvage operation which has been amazing.. ‘Everything is possible’ – the project whose volunteers did the work of collecting all the sleeping bags and some mats. I can only say a huge thank you to them and appreciate all the support they are giving us. Without volunteers at Refugee Council including volunteers at ‘Everything is possible’ and Raphael, likely it would not have been possible to support our clients in this way. Now we have enough sleeping bags for the winter months and the coming months for the most vulnerable, destitute refugees and people seeking asylum. Thank you again to everyone for their support, most appreciated.” - Khami Miraf, Refugee Council (Leeds). This project has a huge impact on the young people. This is a fantastic opportunity to give to young people who couldn’t normally access this kind of event the chance to see their favourite bands while helping the local community and environment. You can read more volunteers feedback by clicking here. About Everything is Possible’s sport project with Disabled people. INCLUSION THROUGH SPORT is a Grundtvig Learner Workshop created and organized by Everything is Possible and supported by ECORYS and the Lifelong Learning programme of the European Union. For one week, 25 mixed ability participants from France, Germany, Italy, Spain and the United Kingdom took part in a sports workshop challenging both bodies and minds in what it is possible to achieve, with dedication, motivation and inclusion through sport.